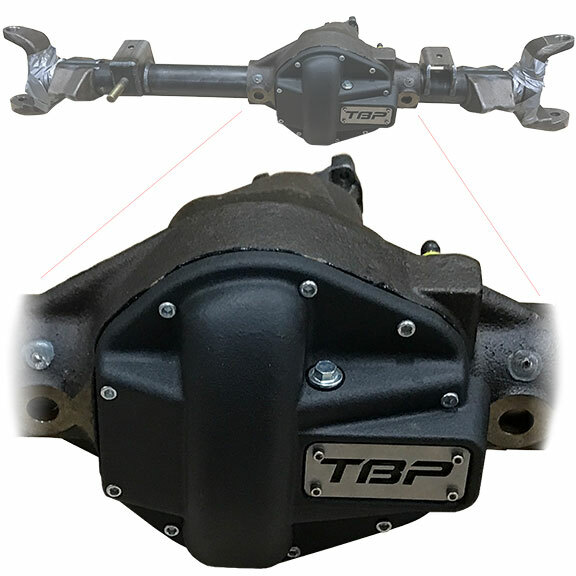 Part of our Trail Terminator line of extreme duty off-road Bronco products, The New TBP "44 Mag" is a heavy duty Dana 44 made 100% in the USA. The casting is a heavy duty, ductile iron piece that uses the larger JK Dana 44 gears only. These gears feature a larger ring gear than a standard 44 as well as a 29 spline Dana 60 size pinion gear. The housings have the factory C-Wedges for use with the Early Bronco front Radius arm suspension. The tubes are 3" x .375" wall and have standard outer knuckle C's so your factory Bronco Dana 44 knuckles can be used. These are completely custom-built units that are made to Tom's Bronco Parts' specifications. They provide a much stronger assembly than the factory Dana 44 and enormous strength gain over the inferior Dana 30. NOTES: Housings do not include ball joints, Accepts standard Dana 44 carriers but uses JK ring and pinion so gear ratios are limited to 4.09, 4.56, 4.88. With our new 44 Mag Dana 44 we added 4 degrees of positive caster to the outer Cs and on the Low Pinion 44 we rotated the Pinion up 2 degrees to help with drive shaft angles.